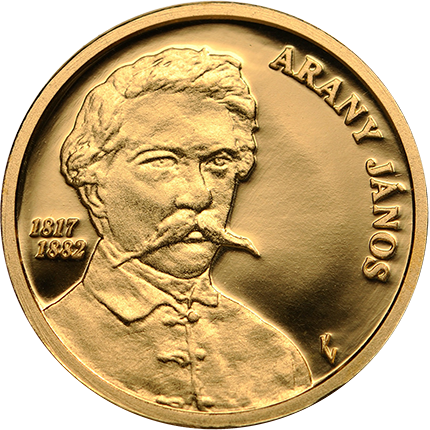 On March 3, the Magyar Nemzeti Bank (Hungarian National Bank) issued three new coins that pay tribute to one of Hungary’s most beloved poets, János Arany (1817–1882), on the 200th anniversary of his birth. Arany is best remembered for his prolific written works, which were translated into other languages due to their excellence and their precise descriptions of the sentiment of the country during its short-lived era of independence in 1848. 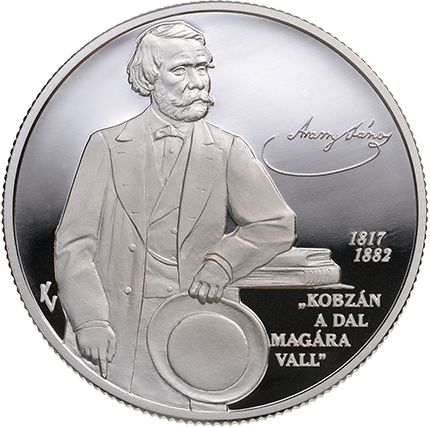 The collector coins were designed by the sculptor Vilmos Király and produced by the Mint of Hungary on behalf of the National Bank. 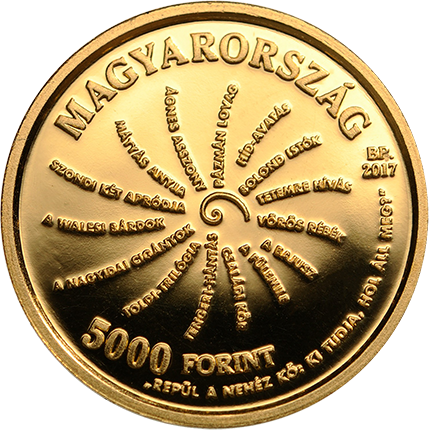 The set consists of a 5,000-forint gold coin along with a 10,000-forint silver coin and an identical, 2,000-forint base-metal coin. The obverse of the gold coin depicts a stylised spiral composed of the titles of Arany’s most important works. Around the lower border is a quotation from his most famous work, the Toldi trilogy: REPÜL A NEHÉZ KŐ: KI TUDJA, HOL ÁLL MEG? (“The heavy stone flies. Who knows where it is going to land?”). The reverse bears a portrait of János Arany by Miklós Barabás (an engraving of the original is shown below the table). 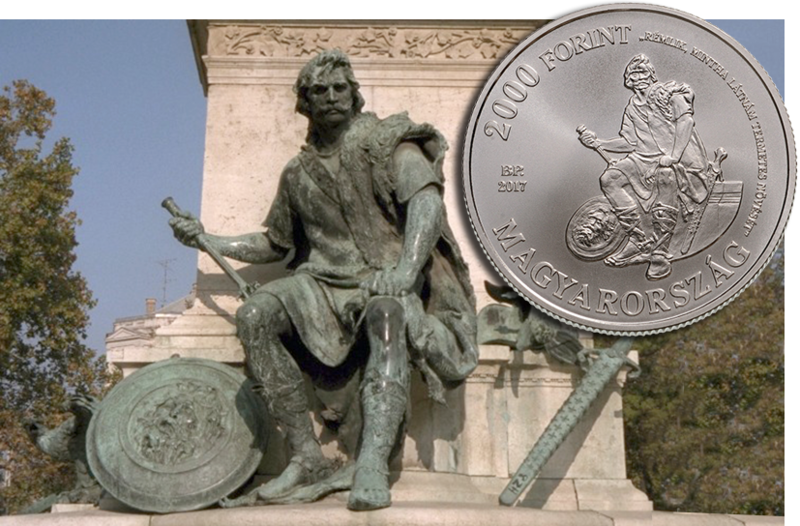 The silver and base-metal versions depict the statue ensemble of Miklós Toldi by Alajos Strobl (see the illustration at the top of the page), which stands before the entrance to Hungary’s National Museum. Around the border to the right is a quotation from“Toldi”: RÉMLIK, MINTHA LÁTNÁM TERMETES NÖVÉSÉT (“I see, it seems, his towering form”). The reverse features a half-length portrait of Arany, the writer’s signature, and a quote from his work entitled “The Bards of Wales”: KOBZÁN / A DAL / MAGÁRA / VALL (“Without salute he strikes the lute”). 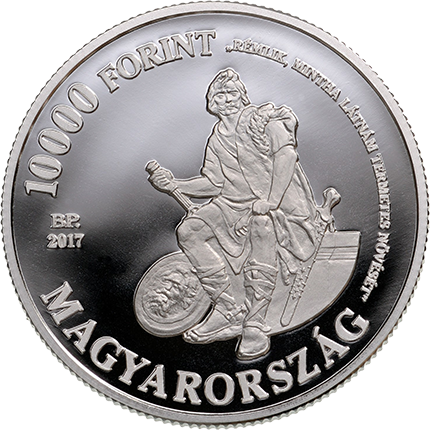 The coins are available directly from the Mint of Hungary individually through their website or at the Mint of Hungary’s own dedicated coin shop at Báthory utca 7, 1054 Budapest. 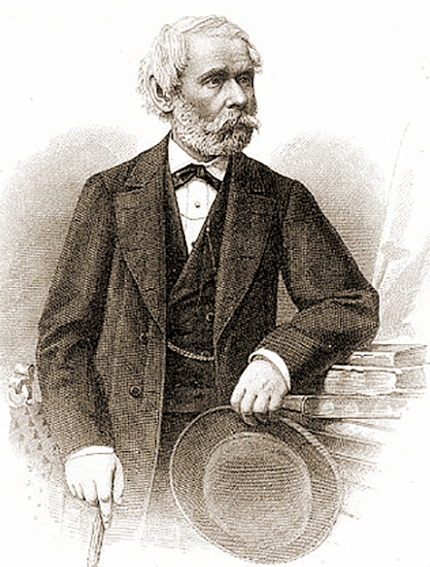 János Arany (1817–1882) was a Hungarian poet, teacher, and editor, and the director of the Kisfaludy Society, a literary organisation in Pest founded in 1836. He was a member and secretary of the Hungarian Academy of Sciences, and became one of the best-known and most renowned figures in Hungarian literature. As the greatest Hungarian ballad writer, he was known as the Hungarian Shakespeare of ballads. Some also called him “the notary of Szalonta” (for his profession), while in his home town he was given the name “the listening man,” most likely in reflection of his character. Arany was born in the town of Nagyszalonta (now in Romania) into a poor Calvinist family. He came to his parents late in their lives and was raised with great care, as eight of his nine siblings had died of tuberculosis before him. From the start, he was a true child prodigy, and he started working as a tutor at the age of 11 to support his aging parents. Despite his austere background, he was very well educated. As an adult he read the great works of Latin, Greek, German, English, and French literature in their original languages; as a result, he carried out a great deal of significant translation work in addition to writing more than 40 ballads, which have been translated into more than 50 languages. His translations of Shakespeare are considered outstanding to this day, and are still read and referenced. His love of language was demonstrated with great excellence and his vocabulary was unparalleled—he used some 60,000 individual words in his works, surpassing his contemporaries by far. His literary career started in 1845 with the satirical epic “Az elveszett alkotmány” (“The Lost Constitution,” 1845), but he achieved real fame with his award-winning narrative poem “Toldi” in 1846. This hugely influential work also led to a lifelong friendship with the poet Sándor Petőfi (1823–1849). Arany was already involved in public life at the start of his career, writing articles on politics and participating in Hungary’s revolution and war of independence in 1848–1849 as a national guard. 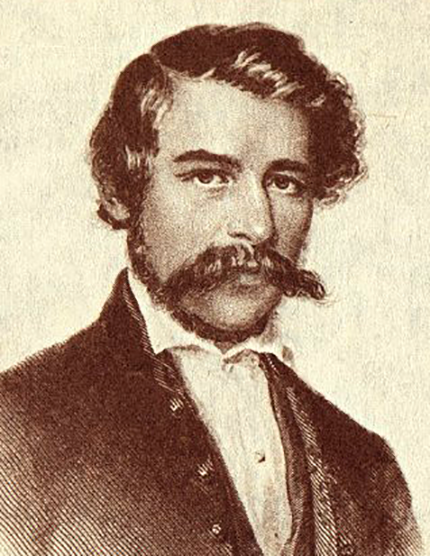 Arany was later employed at the Ministry of the Interior under Bertalan Szemere (1812–1869), himself a Hungarian poet and nationalist who became the third prime minister of Hungary during the short period of the revolution of 1848. After the fall of the revolution, Arany, like other public or influential persons who’d supported the independence of Hungary, was on the run for some time, but he ultimately avoided retribution and moved to Nagykőrös, where he worked as a teacher from 1851 to 1860.